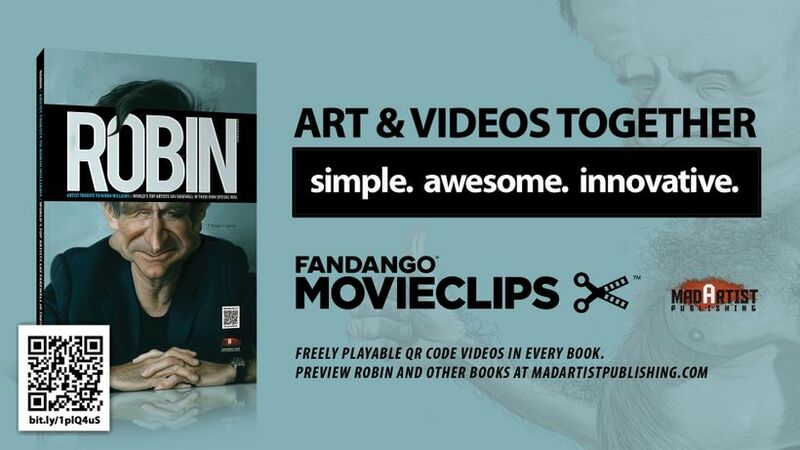 Mad Artist Publishing and MovieClips (Fandango) team up to bring together world’s best artists paying tribute to legendary comedian and actor Mr. Robin Williams. Over 100 of world’s top artists draw, paint and sculpt their renditions of the iconic individual and say farewell in their own special message. 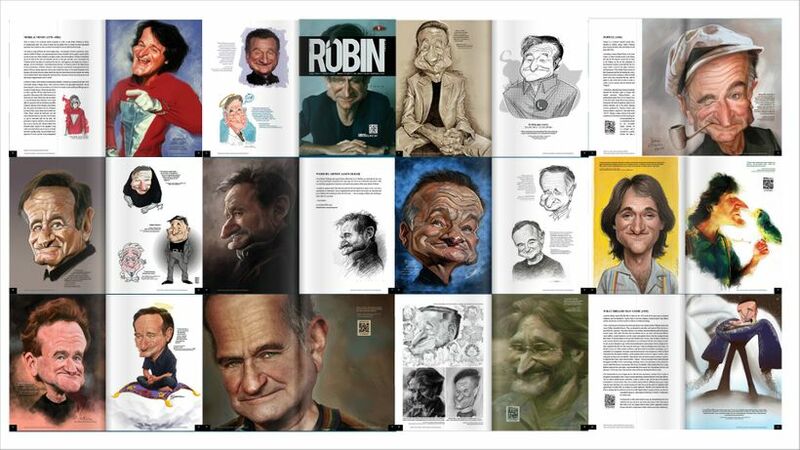 Laugh your way through hundreds of illustrations, paintings, drawings and art pieces dedicated to Robin Williams. Take a moment to Preview & Purchase this limited edition book on Sketchoholic.com, Mad Artist Publishing and be part of history. In addition to hundreds of illustrations, MAP included lots of funny scenes linked in the QR Videos from Williams' best performances. Scan & Watch your favorite ‘QR’ Robin Video Moments with your mobile device right from the book (Brought to you by Fandango Movieclips.com). Tomás Serrano, Hunter Campbell, Bertrand Daulle, Steve Cas, Pauli Bates, Gavin Cameron, Pier "Misterponce" Prigent, Francisco Hidalgo, Carlos Martyn Burgos, Erwin Oscarson M. Guevara, Thibaut Loiez, Georges Miho, Tarek Hakeem, Miguel Torres, Lakshmanan Sokkiah, Marzio Mariani, Daniel Coelho, Dimitris Efstratiadis, Rick Adams, Toni Malakian, Glen Batoca, Nathaniel R Kapnicky, Paulo Pinto, Youngmin Kwack, Agnès Boisramé Jacquelin, Rusty Tabo, Rio Shuvo, Nico Suarez, Sergio Bonavena, Juan Pablo Costa, Mat Roff, Lütfü Çakin, Anthony Lewis, Parvatha Sekhar, Khasis Lieb, Juanpablo Castromora, Ramiro Olavarria, Tiago Santos, Taher Aljishi, Dedy Ronggo, Eddie Duran, William Heflin, Islam Abdelrazek Mohamed, Ricardo Gomes Ryck, Santos Palacios, Emir Farias Saffi, Johny Marquez, Elliott Langford, Anderson De França Oliveira, Guillermo Serrano, Adrián Bueno, Pradeep Rajguru, Anthony Samargis, Vojtech Camfrla, Matt Long, Walter Direnna.